Good morning everyone! Since I finish all of my favorite skincare stuff, I have been switching skincare for quite frequently. My skin got bad and acne starts to foam. A bad sign! So I needed a little treatment. So I strain myself from using the new skincare items that I have been using and start using this Mask & Serum I got from Comain Malaysia. I saw a lot of users has been posting out testimonial about his product and I thought why not I give it a try. It is the Magic Black Cacao Chocolate Pack & the Trouble Spot Ampoule. Both are from Zamian and yes chocolate! The Magic Black Cacao Mask contain 99.9 gold powder,aloe extract, cacao powder, collagen which produce hydrating and whitening effect. It acts as a deep cleansing which can reduce pimple/acne, blackheads and tighten pore , eliminate appearance of line and wrinkles. Just what I wanted! 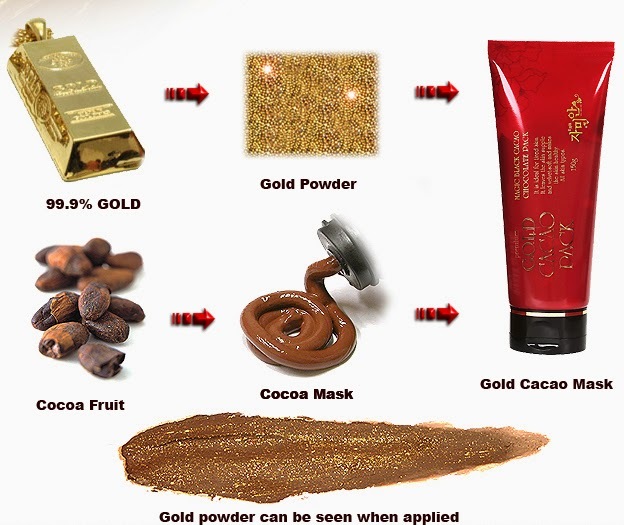 Other benefits of this Korea Gold Cacao Mask ? 9) Moisture, repair & regenerate new skin. This mask has been awarded as a product that is selling succesfully in Korea, 2007 & 2008. Selling Hot in Japan and Taiwan started from year 2008 and one of a top product and highly recommended online. The second product that I use together with this mask is the Zamian Trouble Spot Serum. It is just like a serum that combats dull, tired, sagging skin. Contain arbutin ,adenosine for whitening and anti-wrinkle while patented active ingredient PGA (gamma poly glutamic acid) to keep skin always maintain moisture and elastic. So I start using this since Monday ( 3 November 2014 ). I used the mask 3 times a week, it is on Monday, Wednesday & Saturday during the night. I applied it just like the ordinary mask pack. I use a foundation brush for a neat application. After 20 minutes I rinse it off and use the ampoule. Every night I will apply the Zamian Trouble spot Ampoule all over my face and use just on the trouble spot during the day before sunscreen application. The Zamian Mask has a true chocolate scent. The texture is creamy and easy to apply. After a few minutes I can feel a bit of tight & “heating” going on. The texture of the ampoule is runny but easily spread. Well as you can see and probably scare you. My skin has been very bad these days. 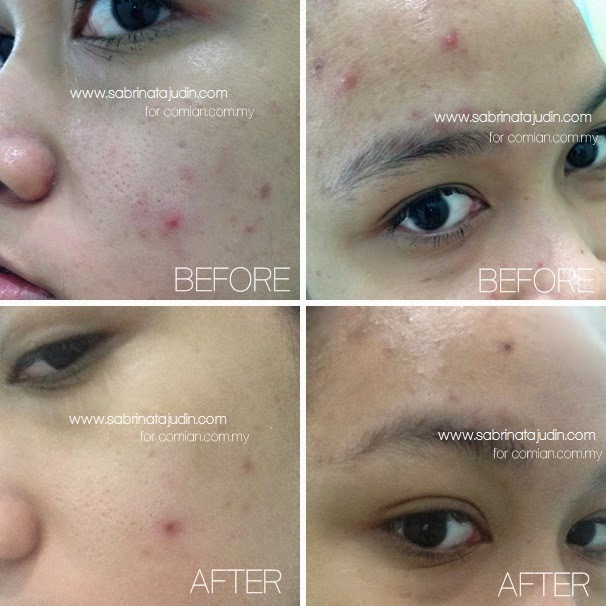 This is the before and after 5 days picture using the Zamian products (the mask & ampoule). My acne is reduce and healed. I am pretty satisfied by the result! This happens after 3 days of continuous usage as mention above. The tube is big and this can barely finish fast! Recommended! Comain is a place where you can get all the latest and best beauty products especially for brand such as Zamian, Zeniswell & Bonanza. Also what special about Comian is that they will provide you the latest beauty tips and consultation. Consultation? Yes, just fill in your skin condition here and they will assist you. It will help you choose a product that suits your skin needs. And one of my favourite section in the store. The beauty accessories! Thy have tons of cool stuff and hard to find accessories in store with great price! All of the products that they bring in the store are safe to use because they will be strictly test the products first before selling it in their website. Also Comain Malaysia provide service such as wholesale for your business needs. Having gold in a product is also good for anti-aging, well, based on Skinfood's Black Sugar Perfect First Serum Gold Edition. Hmm, might wanna consider this next time (I pray not) I have break outs. Results seems promising! i know right. its so frustrating when a new product that you tried make it worst. so far this mask has helped. a lot of research also said that chocolate is good for the skin! Sab,I pun! Sejak nak masuk 25 ni,jerawat naik dekat leher sahaja (dan sangat sakit!). Cuma lately ni dah pandai naik ke muka pula,rasanya disebabkan hormon ni (I stress sangat),dah lama tak breakout. I pernah pakai mask ni,quite good tapi biasalah suka tukar2 hehe. Oh ye,I nak share some products yang mungkin boleh bantu, dorang berkesan untuk I (sensitive skin/ eczema/dry to combi). 2) DIY Greek Yogurt Mask + Turmeric (serbuk kunyit) - My fav mask, syok sebab dia purging lepastu bersih je muka,jerawat pun cepat surut, dan parut hilang. Highly rec.